When Molly Draper found out her 10-year-old daughter, Lena, messaged the local police department on Facebook requesting help with her math homework, she couldn’t believe it. Not only that: they actually responded. Lena sent a message to the Marion, Ohio, Police Department’s Facebook page last week, explaining that she was having trouble with her fifth-grade math assignment. “Do the numbers in the parenthesis first so in essence it would be 37 x 15,” the officer responded. Afterward, Draper posted screenshots of their exchange on Facebook, and the post went viral with more than 2,100 shares. Unfortunately, as some Facebook users pointed out, some the officer’s guidance turned out to be incorrect. “Order of operations… PEMDAS! (Parenthesis, Exponents, Multiplication & Division, Addition and Subtraction). For future reference,” one Facebook user said, referring to the officer’s second answer. But Gruber is hoping people will give him an “A” for effort. 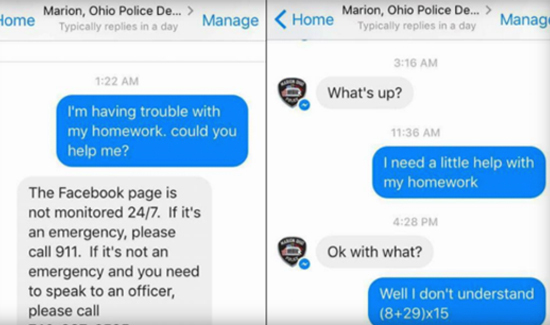 Draper said she had a fun Facebook exchange with the police last summer, which is how her daughter came up with the idea to reach out to the department for homework help. “She told me just after she did it, and I didn’t believe it until I saw it,” Draper said. That may have been the first time her daughter was in touch with the officer, but it won’t be the last.